The October 2013 edition of the SE News provides the latest data available from the ETUI's European Company (SE) Database. As of 1 October, a total of 1,966 SEs were registered in 25 countries of the European Economic Area (EEA), an increase of 105 SEs in the past three months. During this period, at least six ‘normal’ companies (with employees and business activities) – four in Germany and two in France – have finished their conversion process and negotiations on employee involvement, among them the well-known rental car company Sixt. 105 new, 3 deregistered and 1 transformed companies. To our knowledge, only Bulgaria, Croatia, Greece, Iceland, Romania and Slovenia still host no SEs. 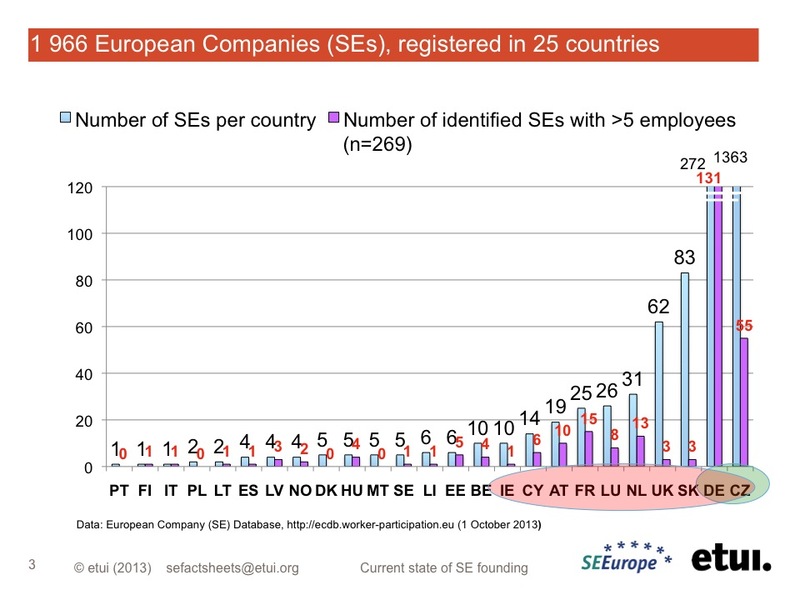 269 SEs have been identified by the ECDB as having more than five employees (so-called ‘normal’ SEs). De facto, however, the number is likely to be significantly higher. 3 SEs moved their registered office from one EEA country to another. In addition to the already registered SEs, the ECDB currently provides information on 8 planned SEs (3 new planned SEs on the list since October 2013).